Accommodate up to 4 People All Apartments Have: A-1 Type Apartments are carefully designed to provide lodging conditions for two people or bigger families. Comfortable living room that contains two (2) sofa beds and the kitchenette, equipped with refrigerator, utensils, sink, hotplates and cooking facilities and a separate bedroom with one double bed or two single beds (baby-cot can be added free of charge). 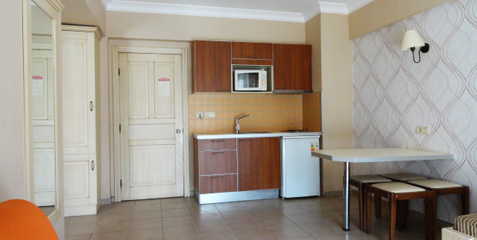 The apartments are equipped with air conditioning, private bathroom, WC and furnished large balcony. These apartments are approximatively 42 square meters. We are cleaning your room daily and changing towels and bed linen every second day. You can dial directly to the UK from your room, by dialing ( 9 ) first followed by ( 00 44 ) and drop ( 0 ) of your area code and then dial the rest number. It will automatically be calculate at reception. You also have TV line in your room, if you want you can hire it. Accommodate up to 6 People All Apartments Have: A-2 Type Apartments are contain two bed rooms and a living room. These Apartments are carefully designed to provide lodging conditions for four people or bigger families. At the entrance there is a comfortable living room that contains two (2) sofa beds and the kitchenette, equipped with refrigerator, utensils, sink, hotplates and cooking facilities and with two separate bedrooms. There is one separate bedroom with one double bed and the second seperate bedroom with two single beds (baby-cot can be added free of charge). 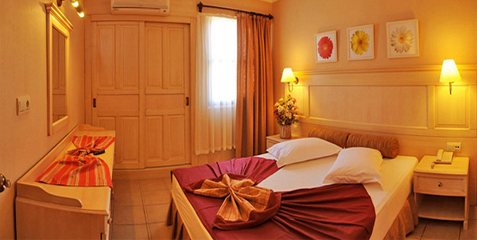 The apartments are equipped with air conditioning, private bathroom, WC and furnished large balcony. These apartments are approximatively 55 square meters. We are cleaning your room daily and changing towels and bed linen every second day. You also have TV line in your room, if you want you can hire it. For further information please contact reception. We have room service from all above. For bar, snacks, and restaurant dial (316), for market dial (324), for reception (0). Accommodate up to 2 People All Hotel Rooms Have: Double Bed or Two Single Beds Air Conditioning 24 Hours Cold and Hot Water Balcony Private Bathroom & W.C. Ceramic Floor Electric Current 220 Volts, Baby-cot can be added free of charge. 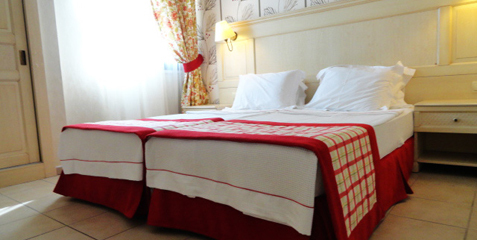 The Hotel Rooms are approximately 20 square meters. You also have TV line in your room, if you want you can hire it. We have room service from all above. For bar, snacks, and restaurant dial (316), for market dial ( 324 ), for reception ( 0 ). We are cleaning your room daily and changing towels and bed linen every second day.